As promised, Apple on Friday kicked off sales of HomePod in China and Hong Kong, bringing the Siri-infused speaker to customers in the region nearly a year after the device launched in 2018. Apple's HomePod is now on sale in China. 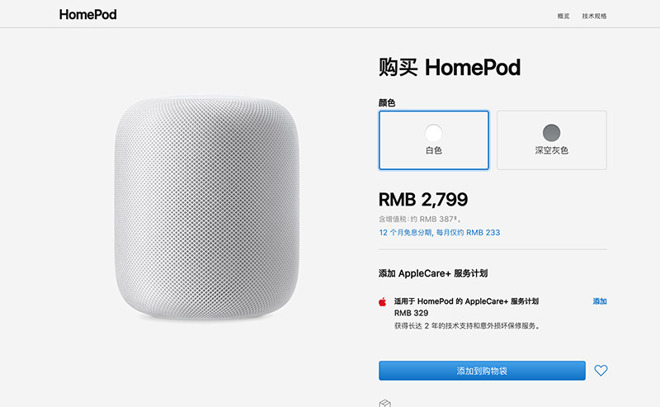 In China, HomePod sells for 2,799 yuan (about $413), while Hong Kong pricing is set at HK$2,799 (about $356), according to Apple's respective regional online stores. Both China an Hong Kong are showing immediate availability with anticipated ship times of one business day. Apple announced HomePod's China and Hong Kong debut in a rare Sunday press release. The promotional material touted regional tweaks to Siri including recognition of queries for music genres "Mandopop" and "Cantopop," which will trigger playback of custom radio stations in Apple Music. The company took HomePod's launch as an opportunity to push its Apple Music, the only native streaming service currently allowed on the speaker. In its Sunday press release, Apple mentioned Apple Music's "New Artist of the Week" program, which features artists like Corsak, Gong, and Lu Xianghui. "We're excited to bring HomePod to our customers in mainland China and Hong Kong markets," Apple SVP of marketing Phil Schiller said at the time. "We can't wait for them to experience how great it sounds in their home, we think they are going to love it." HomePod was unveiled at Apple's Worldwide Developers Conference in 2017, some six months prior to a start to preorders in Australia, the U.S. and UK in January 2018. The smart speaker finally shipped out to customers in February. Availability rolled out in waves throughout 2018, with HomePod arriving in Canada, France, Germany, Mexico and Spain following its February debut. With China and Hong Kong now in the fold, HomePod is available to customers in ten locales. For China, maybe a rose gold version? Why bother? The Chinese will buy the government subsidized counterfeit HomePods that costs 1/3 the amount. If this thing takes off, Huawei will have their own weiPod that's 1/2 the price (of course, with microphone always on so big brother knows what you're up to).